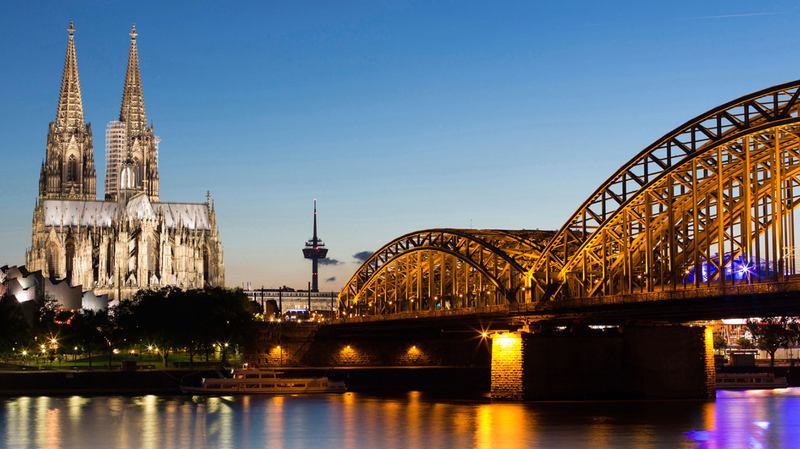 Search for the best flight prices from Stansted to Cologne. Compare prices, book today and save money with Stansted Airport. Beneath the twin filigree spires of the lovingly crafted cathedral, Cologne is a living patchwork of various historical eras; where museums, exhibitions and the beautifully maintained local architecture will carry you along in their wake. Boasting more Michelin-stars than any other German city, Cologne is a capital of culinary adventure, with a host of high quality restaurants dotted around the city that offer a sensationally diverse selection. Despite the intriguing blend Old Cologne throws together of Roman, medieval and modern history, the city’s hotels tend to adhere to a more contemporary theme. The Dorint Hotel am Heumarkt Köln (Pipinstrasse 1) is a five-star offering that is one of Cologne’s small yet stellar luxury choices, located a short stroll from the Heumarkt Square, and contrasting the architecture of the cathedral with its progressive feel. The equally-modern Central am Dom (An Den Dominikanern 3) is found nearby, but fits into the mid-range price bracket, while the Art’otel Cologne Hotel (Holzmarkt 4) is more of a minimalistic option with a quirky nature. For the budget traveller the Hotel Arde (Auf der Ruhr 5) is worth a look. Cologne is an excellent destination for shopping, whether you're looking for the well-known brands and chains of the city centre, the upmarket designer stores of Ehrenstrasse, or the quirky boutiques of the Belgian Quarter. Vintage and chic second hand shops are all the rage, with Zeit der Rosen (48 Merowinger Strasse) usually bestowed with plenty of treasures to explore. Cologne is of course inextricably linked with perfume, and the city’s signature brand can be sampled at Haus 4711 (Glockengasse 22-28). Head to the shopping centre Neumarkt Galerie (Richmodstrasse 8) for a kitsch shopping experience that includes an iconic upside-down ice-cream cone. Cologne is blessed with a reputation for culinary diversity and more Michelin-starred restaurants than any other city in Germany, making it a true gem of the European dining scene. The region’s most sought-after restaurant is Vendôme (Kadettenstrasse) in Bergisch Gladbach, which boasts an incredible three Michelin stars. It can be very difficult to get a table here, in which case Le Moissonnier (Krefelder Strasse 25) is a great alternative, offering a creative French menu in a location that is easier to reach from the city. For classic Italian food head to Alfredo (Tunisstrasse 3), or for Japanese try Taku in the Excelsior Hotel Ernst (Trankgasse 1-5, Domplatz). Well-priced yet delicious tapas meanwhile can be found at La Bodega (Friesenstrasse 51). This wine festival lasts for a week and is centred around Neumarkt, featuring presentations and tastings hosted by winemakers from both Germany and abroad. This pride event is one of Germany’s largest thanks to Cologne’s reputation as a gay and lesbian hub. Every year hundreds of thousands gather to celebrate equality and diversity by enjoying the concerts, processions and parties on offer. Cologne’s charming Fühlinger See lake is the setting for Europe’s biggest reggae, dancehall and world music festival, which sees hundreds of bands perform over a weekend in July. The Cologne winter is brightened up no end by this fascinating festival that sees concerts held in private houses and flats in addition to public venues. Jazz and classical music are the most prevalent genres, but there is plenty more on offer to tickle the fancy of music lovers. The carnival season is long and epic in Cologne, kicking off each year at 11 minutes past 11 on 11 November, and running all the way through to Ash Wednesday. Rose Monday sees the main parade take place, and if you’re planning on going get the words “Kölle Alaaf!” meaning “Cologne above all” locked into your mind in order to greet the locals!